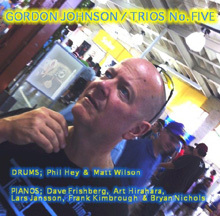 Gordon Johnson's latest release, Gordon Johnson - Trios No. Five is his fifth release in his series of jazz trios that features some of the brightest talents on piano and drums, and backed by Gordon's extraordinary bass work. Gordon Johnson - Trios No. Five was released on the Tonalities Records label and is the fifth in the series of Gordon Johnson's Jazz Piano Trios; see the Music Scene section to read a review of Gordon Johnson GJ4. Gordon Johnson released his first foray into the Jazz Piano trio format back in 1996, and his love of blending the elements of drums, piano, and bass into rich textures of sound and feeling continue to amaze me. His instincts on which song best fits with which set of musicians is truly unique; he pairs musicians with music like pairing a fine wine with a gourmet dinner. The release opens with the track Cilantro (written by Gordon Johnson) that features Swedish pianist Lars Jansson; the song was a result of Gordon and Lars working together in music workshops. Cilantro is a lively track that opens with a fluid piano segment that is paced by a solid baseline; you can feel Lars smiling and enjoying every note that he is playing. United (written by Wayne Shorter) features Gordon's friend and someone who he has shared the stage with many times, pianist Art Hirahara. The song pulsates with a driving drum beat that leads you through the arrangement and hands off the musical baton for powerful and passionate piano and bass solos, but this is all about the dazzling piano work of Art Hirahara. The track Hope features Frank Kimbrough on piano on this improvisational bluesy track; the song ebbs and flows like waves crashing on a beach and creates a relaxing and exciting sound. David Frishberg tickles the ivories with a rumba arrangement of the song Ruby. The track Apart features Bryan Nichols playing piano on a song that he wrote and features Matt Wilson on drums; an animated arrangement that has both musicians pushing each other to new levels. The track Adventureland has Bryan and Matt back together on a track that was written by Matt Wilson; an arrangement that is free flowing like a conversation between two people, with the drums asking questions, and the piano responding in poetic verse. The track Where the Heart Is (written by Art Hirahara) features Art Hirahara on piano on a touching ballad that is made even more emotional by the soft brush strokes on the drums, a beautiful arrangement from the beginning to the end. Art is back on the piano covering the Cole Porter song, Dream Dancing, a bouncy arrangement that is alive with energy and feeling. The release closes with the track Indian Summer (written by Victor Herbert) that features Frank Kimbrough on piano, a light arrangement that ties together the art and soul of the trios music. Websites where you can procure Gordon Johnson - Trios No. Five are Gordon Johnson, CD Baby, and CD Universe. © February 2011. Luxury Experience. www.LuxuryExperience.com. All rights reserved.